Size of this preview: 781 × 600 pixels. Other resolutions: 313 × 240 pixels | 2,522 × 1,936 pixels. Description: Crab spider (Thomisus onustus) capturing the more convenient (the female) of a couple of mating flies. 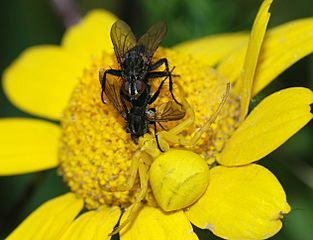 The male fly probably escaped in due course because the spider cannot eat more than one fly at a time and the crab spider has no web in which to store food for later. This page was last modified on 21 February 2017, at 12:42.